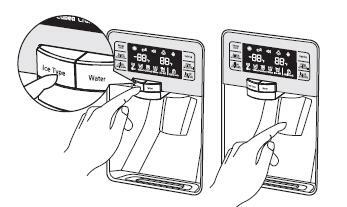 How do I install and use water dispenser through digital control panel on fridge-freezer? How do I install and use the water dispenser through the digital control panel on my Samsung fridge-freezer? 1. Press the Ice / Water button to select the type of ice you want. 2. 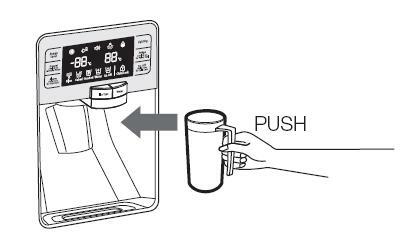 Place a glass underneath the ice dispenser and push gently against the dispenser lever with your glass. Make sure the glass is in line with the dispenser to prevent the ice from bouncing out. 3. Please wait 2 seconds before removing the glass under the dispenser to prevent spills. If the refrigerator door opens the dispenser will not work. 4. When Cubed Ice is selected after using the Crushed Ice feature a small amount of residual crushed ice may be produced. After installation press the dispenser arm for at least 2 minutes to remove trapped air from the water line and to fill the water system. In case ice doesn’t come out pull out the ice bucket and press the test button located on the right side of the ice maker. 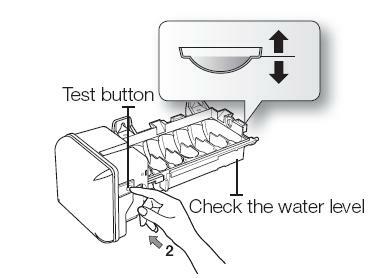 Do not press the test button continuously when the tray is filled with ice or water as in the illustration. Water may overflow or ice jamming may occur. 1. Allow your refrigerator to operate and cool down for 24 hours. 2. Dispense 4 to 6 ice cubes into a glass. 3. After 8 hours dispense a full glass of ice. Do the same again after 8 more hours. When all the ice is used at one time the above steps 2 and 3 must be repeated. This will replenish the ice cubes and ensure maximum ice production. When you dump the ice from the ice bucket you should press the dispenser lever once with the Ice Cubed or Crushed type ON to get new ice faster after replacing the ice bucket in the refrigerator. Place a glass underneath the water outlet and push gently against the water dispenser lever with your glass. Make sure the glass is in line with the dispenser to prevent the water from splashing out. If you have just installed the refrigerator or installed a new water filter flush 3 litres of water through the filter before using it (flush for approximately 6 minutes). Make sure that water flows clearly again before drinking. Note: when you do not use the water dispenser for 2-3 days (especially during the summer) the dispensed water may have a funny smell or taste. If this occurs we recommend that you discard the first one or two glasses of water: the third glass of water onwards should taste normal. When selecting the Ice Off mode remove all ice cubes from the bucket. If you are not using the ice dispenser the ice cubes may clump together. Pull the lock lever forward to throw away ice cubes or remove clumped ice from the bucket. Push the bucket back until you hear a click.